One of the most diverse faunas of Late Carboniferous tetrapods is from Nyrany, a small mining town in the Czech Republic. Fossil tetrapods were first reported from coal mines in this area in the 1870s (A. R. Milner, 1980), and since then many hundreds of specimens have been collected and studied. The fossil tetrapods nearly all came from a 300-m-thick sequence of coalified shales and mudstones near the base of the Nyfany Gaskohle Series (Westphalian D, Late Carboniferous in age, c. 300 Myr ago). These sediments were laid down in an enclosed lake under gentle conditions, and they contain remains of plants such as Calamites, a giant horsetail that grew in up to 1m of water. There are also rare fossils of small sharks, acanthodians and actinopterygians, as well as water-living arthropods and terrestrial millepedes. At the time of deposition of these beds, the lake was small and poorly aerated, and the sediments represent a fairly rapid accumulation. 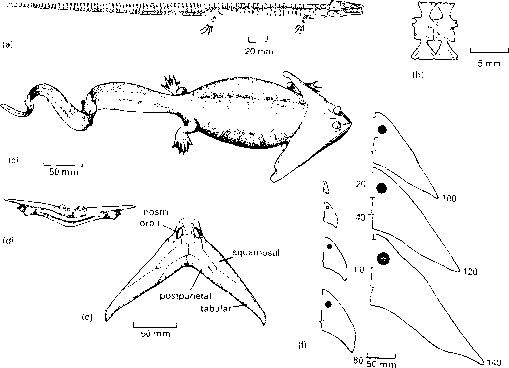 The fossil tetrapods are generally very well preserved, and they occasionally show traces of soft parts here, and in similar localities elsewhere (see illustration I). The cadavers seem to have sunk to the bottom rapidly, with relatively little decomposition and no scavenging. It may be that the animals swam a little too deep in the lake, and encountered anoxic bottom waters that suffocated them. A census of most of the 700 or so Nyfany tetrapod specimens currently housed in museums around the world (A. R. Milner, 1980) shows that there were 20 species of basal tetrapods, with representatives of most major groups, and four species of amniotes. 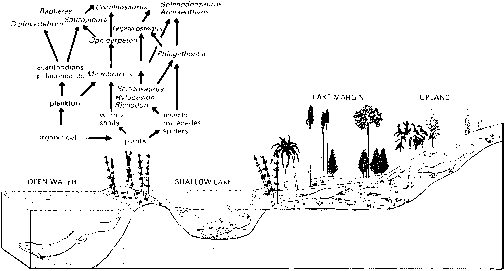 These fall into three main ecological associations (see illustration II). 1 Open-water/lacustrine assocation: three very rare forms from Nyrany, an eogyrinid anthracosaur and two baphetids presumably fished in the open water. 2 Terrestrial/marginal association: representatives of 13 species lived on or close to the shores of the lake. These include primitive temnospondyls, anthracosaurs, an aistopod, four microsaurs and three primitive amniotes. 3 Shallow-water/swamp-lake association: the remaining seven tetrapods from Nyfany all appear to have been partially aquatic, and to have swum rapidly about in shallow parts of the lake where plants grew in the water and where the bottom was covered with plant debris. They include two temnospondyls, a branchiosaur, two nectrideans, a microsaur and an aistopod. Most of these presumably fed on small fishes or small tetrapods. The anthracosaurs, a paraphyletic group that arose in the Early Carboniferous, and survived into the Early Triassic, include a number of moderate-sized fish-eaters. Some were apparently terrestrial, whereas others became secondarily adapted to life in the water. 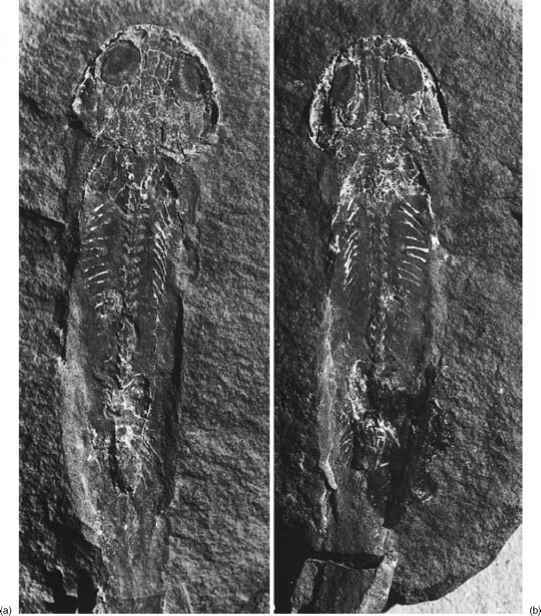 Proterogyrinus from the Lower Carboniferous of West Virginia, USA (Holmes, 1984) and Scotland is about 1m long and has an elongate skull (Figure 4.15(a-d)). The skull table, the square area at the back of the skull (Figure 4.15(a, c)), is set off from the cheek area, and there is a line of weakness between the two units that presumably allowed the skull to flex during jaw opening, as in osteolepiforms. Proterogyrinus has large vertebrae, a short neck and a flat-sided tail. The limbs are well developed for moving rapidly on land, but the flattened tail shows that Proterogyrinus could swim well. Later anthracosaurs, such as Pholiderpeton from the Upper Carboniferous of England (Panchen, 1972), were even more clearly adapted for an aquatic lifestyle, with their long slender bodies, small limbs and deep tail fin (Figure 4.15(e)). a neural arch above (Figure 4.16). Then, in the early evolution of tetrapods, the pleurocentrum became the main element of the vertebra in reptiliomorphs and amniotes, and the intercentrum became the main element in temnospondyls and lissamphibians. 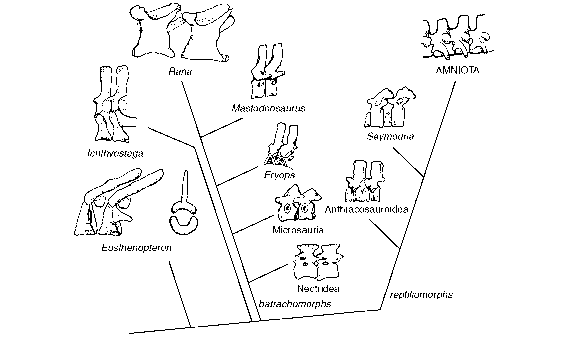 This split in vertebral evolution among tetrapods is documented in successive fossils. The vertebrae of Eusthenopteron and Acanthostega are similar in that the intercentrum is the dominant element, a crescent-shaped structure in anterior view, wedge-shaped in lateral view, that lies in front of the smaller pleurocentrum, composed of two short elements, one on each side. In 'anthracosaurs', the intercentrum and pleurocentrum may be of equal size, and then the in-tercentrum reduces to a small wedge in seymouri-amorphs, and reduces even further in amniotes, becoming either a thin plate or disappearing altogether. 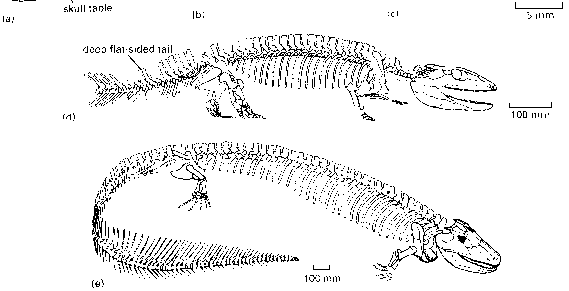 In temnospondyls, on the other hand, the intercentrum expands and the pleurocentrum reduces to a small wedge. The vertebrae of two groups, the lepospondyls and lissamphibians, have been much debated. Lep-ospondyls have holospondylous vertebrae (see section 4.4.3), but is the fused centrum the pleucrocentrum or the intercentrum? As expected from their phylogenetic position (see Box 4.5), the centrum of lepospondyls is composed of the pleurocentrum: while this is not clear in nectrideans and aistopods, many microsaurs have a small intercentrum tucked under the pleurocentrum, and the two elements fuse to form a single centrum. The single centrum in lissamphibians is presumably composed largely of the pleurocentrum, as their closest relatives, the dissorophoids, are unusual among temnospondyls in that the pleurocentrum is much larger than the intercentrum.